The guy with the sign has repentance all wrong. For instance, let’s say that we make a huge error in judgement and embezzle funds from our employer. So how do we repent of this misdoing? Maybe we force ourselves to feel guilt, shame, and remorse. Maybe we confess what we have done. Maybe we come up with a plan to repay our employer. Maybe we do time in jail or community service. Most of all, we start adhering to the rules that we have broken. That is what scripture means by repentance – right? Wrong! In the parable of the lost sheep, repentance occurs when the sheep simply allows the shepherd to scoop it up and carry it home where the shepherd’s friends are waiting to greet it. It is the act of saying “yes” to God. I know something about this. 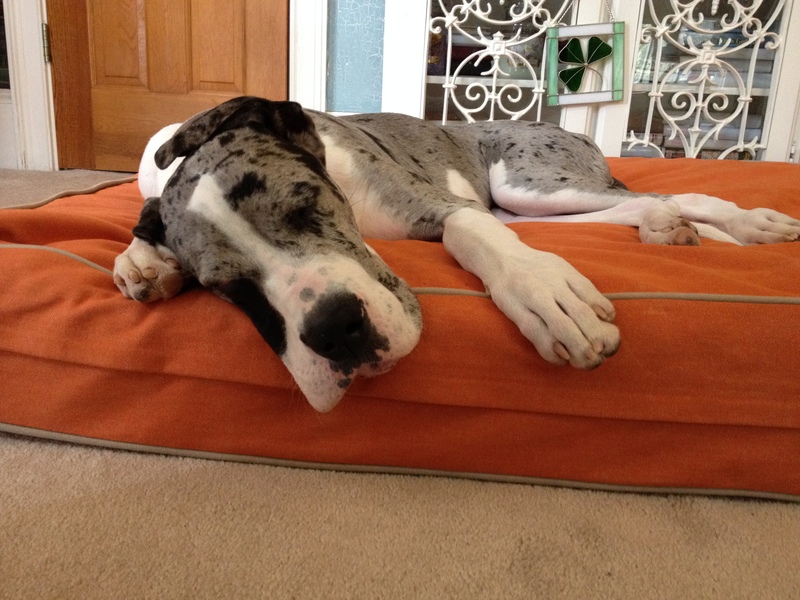 I have a Great Dane puppy who is eight months old and weighs almost 90 pounds – about the same as a middle eastern sheep. I couldn’t scoop her up now if I tried. But a few weeks back when she only weighed fifty pounds, I could. One day back then, she got out of the house when some friends had come to visit me. I tried the “here” command. She stopped, she looked at me, she waited until I got an arm’s length away, and then she ran. When I got close to her again, she lay down and rolled over on her back knowing that I could not pick her up while she was in that position. She playfully nipped at me when I tried to put the leash on her. She lay there and waited. She felt guilty. She knew running from me was wrong. She had even stopped doing it. But until she said “yes” to letting me pick her up and carry her home where my friends were waiting to greet her, she had not repented. In the parable of the prodigal son, where the son takes his father’s money and leaves home only to lose it all, it is the same thing. Many people think that when the prodigal son is sitting in the pig sty realizing what an idiot he is, feeling guilty, putting together a plan to become his father’s slave that it is then that he has repented. But he hasn’t. Some say that when he turned to go home, that he had repented, but he hasn’t. When his father runs to meet him in the road, he starts to tell the father the terms of their new relationship, “I will follow the rules – I will be your slave.” The prodigal son is still trying to define the terms of his relationship with the father. But the father isn’t interested in the son’s terms. The father doesn’t want a son who follows a list of rules and acts like a slave. He just wants his beloved son back – to be in a father-son relationship with him. He wants to bring the son into his house, gather his friends, and have a party. Repentance happens when the son stops trying to define the relationship by a list of rules that he will agree to follow and instead lets the father hug him, wrap him up in a new garment, and bring him home. Jesus was telling this parable to the Pharisees who were mad at Jesus because he wasn’t following their religious rules. He is telling the religious leaders that all of their crummy religious rules are absurd!! Religious leaders take note! God doesn’t care about your rules. God wants a relationship with you. And God wants you to encourage the people in your religious community to have a relationship with God too. God wants to be their God and for them to be God’s beloved children. Repentance is when we accept that love from God. It does not require that we feel guilty or shameful enough. Nor does it require that we sign up to follow a list of rules. It requires that we let God scoop us up and carry us to God’s home (and I am in no way talking about heaven – I am talking about God’s kingdom here on earth) where we get to party with his friends. For it is when we say yes to going home with God that are agreeing to spend our lives with God in God’s house with God’s friends. It is then that God has the opportunity to transform us into the hands and feet of Jesus so that we can love others as God has loved us. Back to the embezzler. You can’t fix your greedy ways by yourself. But you can say yes to letting God transform you – pick you up and carry you to the beloved community where you will be a beloved child transformed by the love of God. Sadly, most Christians – just like the Pharisees – are out there defining a list of rules and making sure everyone is following them too. April describes herself as a Red Letter Christian who writes about scripture and spiritual disciplines. See her latest book, James in the Suburbs: The Disorderly Parable of the Epistle of James. It is equally great for group Bible studies or to be read as a novel! i agree with Stuart. Turning back to the Father means turning back to His ways. As our relationship becomes closer with the Father, our actions should follow His will. The guilt that we feel is the Holy Spirit leading is back to His will. In the prodigal son, the father didn’t make the son become a slave to him, he welcomed him back into the family; however, he didn’t give him more money and tell him to go back on the road of partying. Sin is still sin. We all fall short and sometimes make mistakes. God’s grace covers our mistakes. However, living a life of sin isn’t turning to God. God knows our hearts and knows when out sin is a mistake or a choice. Reading this article seems to imply that the embezzler can continue in his Greed as long as he claims to love and accept Jesus. While he can’t change his greed on his own and Jesus loves him as he is, Jesus loves him too much to leave him as he is. I think I agree with your comments on what repentance is but I’m not sure that I agree with you on what it is not. Turning from sin and following the “rules” or rather God’s will is part of repentance. Flawed as we are we will sin again because it is impossible for us to follow all the rules and that is why we always so desperately need God’s grace. Once we have received grace though we are forgiven and as you say we don’t need to feel guilt and nor should we. We should though follows Jesus’s instruction and “sin no more”.